C.S. Friedman has written thirteen novels to date, as well as numerous short stories. Her works have been published in Russian, Dutch, Polish, Italian, and German, as well as seperate printings in the UK. Patiently, the messenger repeats himself. "Braxin forces have taken the Azean colony on Lees," he recites slowly. "This constitutes open defiance of the" (he consults his notes) "nine-hundred and eighty-fifth Comprehensive Peace treaty between Braxi and Azea." "Yes, yes, I know all that. What were their grounds - tell me that again." The messenger reads it verbatim. "Kaim'era Vinir, son of Lanat and Kir'la, wishes to give his son the public name of Zatar. Therefore the Kaim'erate considers the current peace treaty invalid and without binding force." Slowly the Emperor leans back in his throne. "Yes. That's what I thought you said." With this novel, C.S. Friedman has set a new standard for science fiction. An epic tale of competing civilizations, her book highlights the lives of the two greatest generals in the galaxy, Zatar of Braxi and Anzha lyu Mitethe of Azea. 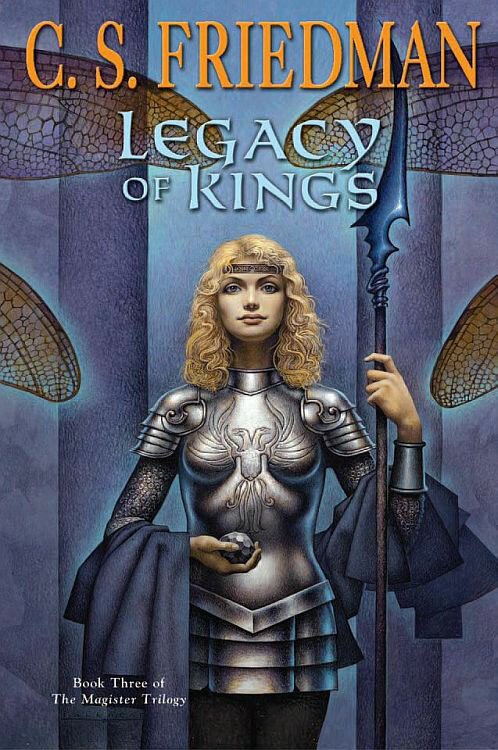 The characters are richly detailed, and Ms. Friedman is a master at setting the stage for future events not with direct narrative, but with what can be called indirect narrative - the use of subplots and secondary characters to advance the development of the main characters or storyline. A good portion of the novel is told this way, and it is through these counterplots and side stories that we gain insight into the inner workings of the two societies, and thus, the two protagonists. Add to this the exploration of the theme of conflict in all its diversity and the subthemes of religion, politics, language, sexuality, and hatred, and you end up with truly a powerful novel. Although it can be enjoyed for it's surface story of two warring peoples, what really separates this work as superior are all the subtleties and levels of meaning that the story has to offer. This is a book that must be read more than once to truly appreciate and capture all it has to offer. A sweeping story of two interstellar civilizations�locked in endless war, it was nominated for the John W. Campbell Award. In celebration of the 15th anniversary of ICB, this edition includes an updated cover painting plus a glossary and a chapter from her next novel, The Wilding. The glossary should be a good introduction for people who haven't read the work before, and have some interesting new stuff for people who did. © 1990, DAW Books, Inc.
"How long have you lived on this planet?" it demanded. The abruptness of the question threw me. I had dreamed those very words in a thousand nightmares, said in every place and by every being that the Conquest might make possible. But in each of those dreams, no matter what my response, I failed to save myself. I died. Because there was no magic number that the Tyr would find acceptable; if it knew to ask the question, it knew too much already for any answer to be safe. What could I say? To be caught in a lie would mean certain execution; to tell them the whole truth, if they didn't already know it, might be even more damning. Just as C.S. Friedman explored the topic of human conflict in In Conquest Born, her second novel revolves around the themes of self-identity and self-discovery. The main character in this story is Daetrin, a human surviving in the post-conquest of Earth by the alien Tyr. His past is discovered, and in his escape from captivity he discovers a means to free mankind from the alien tyranny forever. 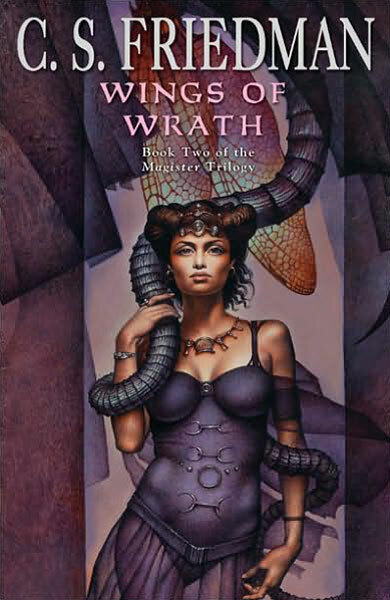 Again Friedman uses secondary characters and events, in this case a friendly alien named Marra and a quirky Tyr named Frederick to indirectly illustrate the person named Daetrin as he progresses not only on a journey to free man from slavery, but also on the path to accepting who and what he is. This is a more reflective work than In Conquest Born, and some readers have felt that it not quite measure up to the same standard. The real difference however is not that The Madness Season is an inferior work, but that it is more dependent upon the reader to contemplate what is written; a Japanese haiku as opposed to a Shakespeare sonnet. The true subtlety of this novel lies not in leading the reader through the self-acceptance of Daetrin, but in using the story of Daetrin to encourage the reader to discover and accept him/herself. © 1991, DAW Books, Inc.
ISBN: 83-87968-65-X (Polish) as "Swit czarnego slonca"
He raised a long knife into her field of vision, even as his slender hand stroked the hair gently out of her eyes. "You go to a far gentler afterlife than I will ever know," he said softly. "I apologize for the pain I must use to send you there. That's a necessary part of the process." The hand dropped back from her forehead, and the glittering blade was before her eyes. "The sacrifice is not of you body," he explained. His voice was cold in the darkness. "It is...of my humanity." © 1993, DAW Books, Inc.
ISBN: 83-87968-65-0 (Polish) as "Nadejscie nocy"
"You can't stop it now. The offer's been made. The sacrifice-"
"Is canceled, here and now. Move back from the tram." For a moment Ian just stared at him; comprehension dawned at last. "You thought I was going to kill them," he whispered hoarsely. Incredulously. "You thought I would kill my own people-"
"What the hell was I supposed to think?" Case snapped. "You took them from the camp. You dedicated a sacrifice, then came at them with a knife. You tell me what conclusions to draw from that!" Case shook his head sharply. "You forget that we were here. We heard you. I give you the lifeblood of Terra-"
He stopped. Stared. Through the eyes of a man, into the madness that lay beyond. © 1995, DAW Books, Inc.
ISBN: 83-87968-30-7 (Polish) as "Korona cieni"
The dreams were all he had now. The hate was all that was holding him together. Alcohol to numb the fear, to ease the pain of remembering. Cerebus for the madness within him, the beast that must have outlet now and then or it would swallow him whole. Slowtime for visions of color and music in a world washed gray by sorrow. And blackout - blessed blackout - little black pills for a taste of oblivion, for shadows of death to fold about him like a cocoon, shutting out all the pain and the beauty and the hope and the fear - shutting it all out, every last bit of that agony called life. Long enough for him to rest. Long enough for him to sleep. Blackout for the coward within him, afraid to go on living but more afraid to die. © 1998, DAW Books, Inc.
ISBN: 83-87968-17-X (Polish) as "Obcy Brzeg"
This is to be another science fiction novel, and the early word I've received is that it's going to be the best work she's ever done. "As you all seem to have noticed, my works grow out of themes as much as plots - and the themes in this one are human madness, obsession, and a true interface between mind and machine (I find most cyberpunk treatments of this theme sadly lacking, myself). When insanity is the key to ftl travel, what does that make of the universe?" "Not trying to imitate ICB in the new book, only capture some of the elements that made it successful -- a high tech, highly fragmented society with intensely competitive elements, dark and violent angst, an exploration of the limits of the human mind...it is, in fact, the only thing I have worked on thus far that could actually have a sequel, as the world is really complicated enough to support that." "The toughest part of TAS is that one of my main characters is an adult autistic. Such people may function well in many areas, but are insensitive to many of subtle emotional signals that accompany human interaction. Any sections from his POV therefore cannot use the kind of information that is an author's stock-in-trade, that is, insightful observation of other characters' mood and motivation." © 1998, White Wolf, Inc.
A young Cappadocian receives a mysterious invitation to a fear-shrouded monastery. There he finds fragments of the original Book of Nod � in a language that has been dead for thousands of years. Who has led him to this place? What has he uncovered? And why has he been chosen to transcribe the words of one who could be Caine himself? Who Found it and Why? Written by noted science-fiction novelist C.S. Friedman, The Erciyes Fragments is a version of the Book of Nod that has never been seen before by mortal eyes. The most sage of vampiric scholars provide their commentary for your enlightenment. Revealed now for the first time are the prophecies of Nod and of Gehenna! © 2004, DAW Books, Inc.
Two hundred years have passed since Anzha lyu Mitethe's psychics were scattered to the far ends of the galaxy. They are legendary creatures now, rumored to be half mad from the mental fallout of the Institute's destruction, surfacing but rarely to raid the Empire for supplies, information...or more human trade goods. In the Holding, the proud Braxana have attended to the needs of their gene pool with typically barbaric elan, resurrecting traditions that have not been in play since their tribe inhabited the Blood Steppes. In the shadow of their newfound obsession other tribes stir, wondering if the time to unseat them has come at last... while the echoes of Zatar's curse reverberate in the chambers of a power. Set in the society formed in the aftermath of the events at the end of In Conquest Born, not too much else is yet known. The complete skinny can be found on The Wilding page. © 2007, DAW Books, Inc.
At the end of her bestselling Coldfire Trilogy, C.S. Friedman challenged readers to imagine what a world would be like if sorcery required the ultimate sacrifice--that of life itself. 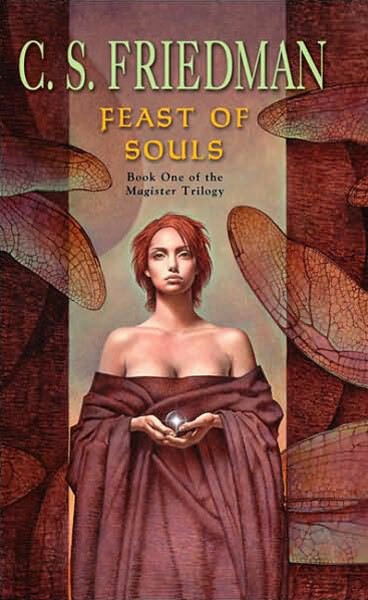 Now, in a groundbreaking new fantasy novel, FEAST OF SOULS, she introduces us to a terrifying new world in which the cost of magic is just that--a world in which the fuel for sorcery is the very fire of the human spirit, and those who hunger for magical power must pay for it with their lives. In this epic tale of terrifying shadows and desperate hope, the greatest threat of all may not be that of ancient enemies returned, or ancient wars resumed, but of the darkness that lies within the hearts of men. Find more info at the Magister Series page. © 2009, DAW Books, Inc. In a world where spells are fueled by the essence of one�s own life, the young peasant woman Kamala has proven strong and determined enough to claim the most powerful sorcery for her own. But her rise to power is not without cost. The shadowy brotherhood of Magisters now hunts her for killing one of their kind, and her only hope of survival may lie in fleeing to the northern Protectorates, where spells are warped by a curse called the Wrath and the shadow of an ancient Enemy is once more falling across the land. Joining company with the Guardian Rhys, she will soon discover the true origin of the Wrath, and learn of an ancient artifact that might awaken the northern bloodlines to their true potential�if it does not drive them mad first. For an ancient Enemy has indeed returned to the civilized lands � a creature said to feed upon the souls of men � and its human agents are already hard at work. In the High Kingdom, where the monk Salvator Aurelius has just claimed his father�s throne, the unity of a great empire is about to be tested�along with its ruler�s faith. In the halls of Kierdwyn, the terrible truth at the heart of the Guardians� mission is about to be revealed. And in warm southern climes of Sankara, the woman called Witch-Queen is about to receive an offer she dares not refuse: true immortality, and with it revenge upon the Magisters who used and abandoned her. But acceptance will require that she become something other than human, and agree to serve those who pave the way for the souleaters� return. © 2011, DAW Books, Inc.